The flanger effect was originally achieved by manually independently varying the speed of two tape recorders with the same program material during studio recording mixdowns. The LUSH flanger pedal recreates that rich, natural, golden studio flanging effect. With extended onboard controls, you'll find the key to a new modulation world. 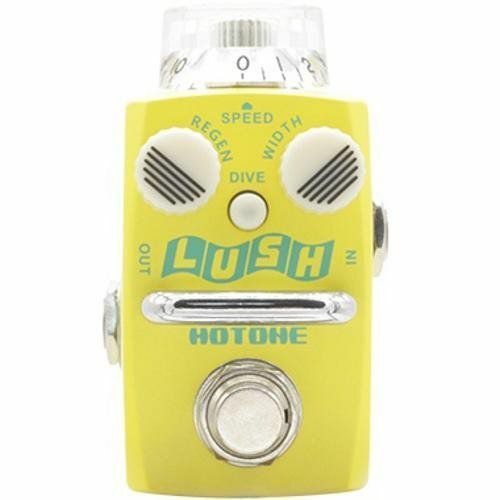 Use the DIVE button to engage negative feedback flanging mode, which features an underwater sound character with twisted EQ (cuts the low frequency).Features:True Bypass FootswitchZinc Alloy Outer CoverTransparent top knob and 2 noctilucent small knobsCool LED lightsCurrent Consumption: 25 mADimensions: 74mm (D) x 44mm (W) x 44mm (H)Weight: 190 gGet your Hotone SFL-1 Lush Analog Flanger today at the guaranteed lowest price from Sam Ash Direct with our 45-day return and 60-day price protection policy.